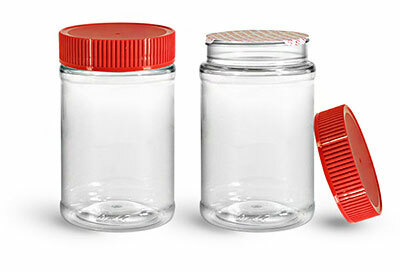 Choose these custom created clear PET food jars with red induction lined caps for your line of food products, such as nut butters and spreads. These clear plastic jars offer all of the standard features of many popular peanut butter jar styles, with several unique improvements. Compared to standard jars, these peanut butter jars have flatter bases that are sturdier for secure storage on store shelves, they offer larger label panel areas, and feature shorter necks for reduced product loss. The red induction lined caps are ribbed for convenience and create hermetic seals when the liners are activated, protecting your products and helping to maintain superior freshness.